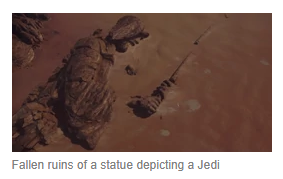 In Rogue One (2016), when transitioning to the planet Jedha, there's shown an extremely large, fallen statue of someone. Who is this a statue of, what's their significance, and why is it now in ruins? That is an un-named Jedi. As more of the galaxy was mapped, more direct hyperspace routes were discovered. These new passages made the old, winding routes, such as those connecting with Jedha, obsolete. The once-popular Jedha became an antiquated curiosity rather than a relevant destination, a location for those who desired spiritual guidance, a deeper purpose, or to simply exile themselves from the larger galaxy. Not the answer you're looking for? Browse other questions tagged analysis star-wars rogue-one . Contradictions in Star Wars about advocating pacifism? Why did Cassian Andor abandon his mission? How did the rebels crash the two space ships into the gate?